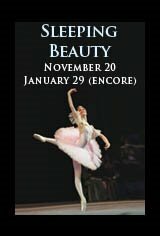 The classic tale of Sleeping Beauty, broadcast LIVE from the world renowned Bolshoi Theatre in Moscow. Don't miss this incredible production starring the Bolshoi's newest, and first ever American, principal dancer David Hallberg! Also starring Svetlana Zakharova.